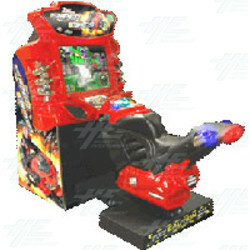 Super Bikes is a riding game modelled from the hit movies "The Fast and the Furious". This game is all about the motor bikes, featuring breathtaking locales from Shanghai to Monaco, Sturgis to Switzerland and others. Super Bikes features 14 licensed motorcycles from the world's top manufacturers including Ducati, Kawasaki, and Yamaha. In true FnF style, you have total control over the look of your bike by adding engine upgrades, different body mods, NOS and much more. Saving your garage full of tricked out bikes is easy with the keypad, no more losing cards or keys. You also get to pick from 8 different riders on Super Bikes. From the hard-core biker gangster to the hot blonde, you get to choose who gets to handle your ride. The riders also have over 30 different tricks that they can perform, including barrel rolls, helicopters and most importantly, drifting. Drifting (AKA Power Slides) is a huge part of Super Bikes and it can mean the difference between first and fourth place. Learn to master this skill and you are going to be able to take anything that these challenging courses can throw at you. Super Bikes features 14 licensed motorcycles from the world's top manufacturers including Ducati, Kawasaki, and Yamaha. In true FnF style, you have total control over the look of your bike by adding engine upgrades, different body mods, NOS and much more. Saving your garage full of tricked out bikes is easy with the keypad, no more losing cards or keys. You also get to pick from 8 different riders on Super Bikes. From the hard-core biker gangster to the hot blonde, you get to choose who gets to handle your ride. The riders also have over 30 different tricks that they can perform, including barrel rolls, helicopters and most importantly, drifting.